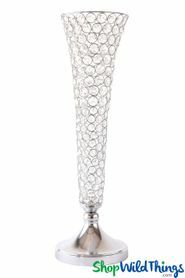 Crystal Beaded Topper for Vases and Risers 11 1/2" Diameter with 10" Long Crystal Strands. Maximum Width of Vase for this Topper is 5". This incredible netting of crystal clear acrylic beads is the perfect centerpiece topper! 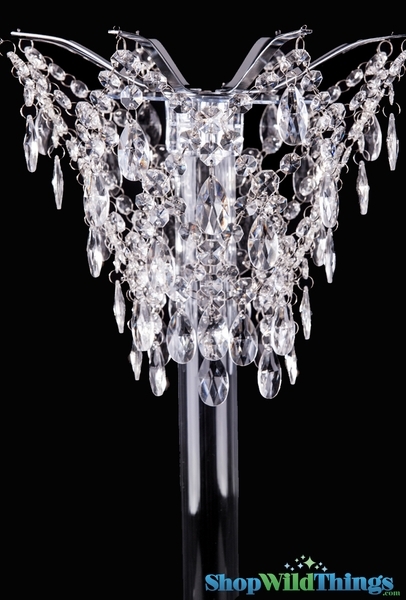 These high quality beads sparkle beautifully and setting a light on top makes this piece absolutely GORGEOUS and a major feature is that it's so versatile! It measures 11.5" in diameter, and the beads hang at 9" long in the middle and 10" long at the perimeter. 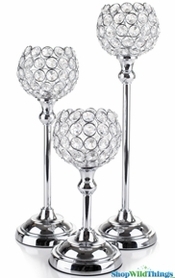 The length varies because the 8 silver arms holding the beads are slightly angled up, creating a cradle to hold a light, a floral arrangement or a bowl. This topper fits on a vase or pedestal that has a maximum diameter of 5" and the center hole is 1 3/4" in diameter. For beautiful centerpieces, fill a Clear Glass Cylinder Vase with jelly Decor and submersible lights, rose petals or flowers, set this topper on the vase, then add a Floral Pomander Kissing Ball! Done! The design of this topper decoration makes it a very popular item because it's so versatile and it totally changes the look of a plain vase or riser. It will sit on top of an Eiffel Tower Vase but needs to be secured. For the photo of this Chandelier Topper on the Riser, we used an 8" plate with an 18" tube then gently pushed a 6" plate through the webbing and turned it upside down to create a platform for the topper, then inserted an 8" tube to secure the topper. On the top of the topper, a 6" LED Light Disc fits well or you can use a 6" Lomey bowl to float flowers or LED Floating Candles. PLEASE NOTE: THIS ITEM DOES NOT INCLUDE THE STAND. IT IS FOR THE TOPPER ONLY. 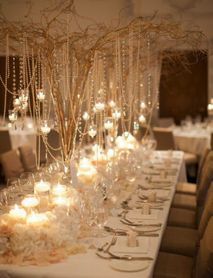 Awesome, these chandeliers add a wow factor to your centerpieces!!! 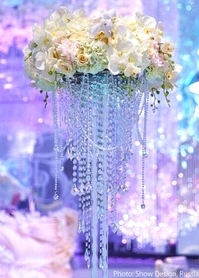 The vase topper is absolutely stunning on a tall vase. I have purchased nine in all with plans to purchase more.